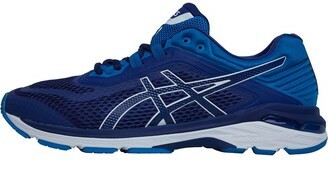 Code: IN6AS1772 Colour: Royal Blue/Teal Blue/White Product Detail: Asics premium GEL cushioned stability running shoes. This popular design has been updated for enhanced comfort with the Flytefoam midsole Guidance Trusstic and DuoMax support to help the overpronator into a smoother run no matter the distance. Breathable mesh upper with synthetic overlays. Fused construction provides for seamless comfort and durability. OrtholiteÂ® antimicrobial sockliner. Rearfoot GEL Cushioning System - absorbs shock during the impact phase and allows for smooth transition. Flytefoam utilizes organic fibers that are embedded into the foam to offer lightweight resiliency. SpEVAÂ® midsole - improves bounce-back characteristics and decreases midsole breakdown. Designed for comfort and extra cushioning. Dynamic DuoMax Support System uses a dual-density material in the midfoot to reduce over pronation. Full Length Guidance Line - Vertical flex groove decouples the tooling along the line of progression for enhanced gait efficiency. AHARÂ® (Asics High Abrasion Resistance Rubber) outsole. Robust material placed across critical areas of the shoe for exceptional durability. Special Instructions: Ideal for neutral and overpronating runners who require cushioning, stability and support.